Elements are the main building blocks of your display. Every display item you want to use in your show will need either an element, or an element group defined for it. An item such as a single string of lights is defined as a single item in the Element Tree. So, if you have a string of lights that is a single color, or even a single multi-colored standard string, it is defined as a single element. Think of if this way. If you plug it in and can only control the entire string at once, it is a single display item. Conversely, if you can set each light to any number of colors or there are is more than one controllable item in the string, it is not defined this way. 1. Right-click somewhere in the white-space of the Element Tree and select Add. 2. Give your element a name. We’ll call ours Mini-Tree 1. The new element will be added to the list as a single node. 3. Click on the newly created element to select it. 4. Make sure “Color Handling” is selected in the “Selected Item(s)/Configure” section and press the Configure button . 5. When the Color Configuration dialog box appears, click on the first radio button (“They are a single color…”). 6. Click the color box (blue in the above graphic) to define the color of this element. 7. Click OK when you’re done and you’ll get a dialog box telling you what you just did — hit OK on this dialog to close it. 8. That’s it. You’ve successfully defined a single element for your display. There is no need yet to link anything in the Element Tree to output controllers. With these elements defined, you can sequence your display and setup a preview. Only when you are ready to physically connect your output controllers do you need to come back and mess with the controllers. 1. Select “Generic Numbered Group” from the “Add” combo-box under Element Setup. 2. Click on the to the right of “Add: Generic Numbered Group”. 3. A dialog box will appear that lets you name your new element group and each item within the group. We’re going to fill ours out with a group name of Mini-Trees, an item prefix of Mini-Tree and an item count of 16. 4. 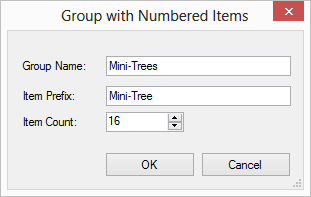 When you press OK a new group will be created at the bottom of the Element Tree named “Mini-Trees” with 16 individual trees named “Mini-Tree-X” where X is the number of the item. 5. 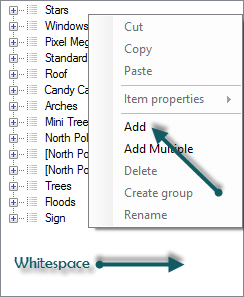 Now, we need to define the color-handling for these items… Click on the Mini-Trees group so it is selected. 6. Make sure “Color Handling” is selected in the “Selected Item(s)/Configure” section and press the Configure button . 7. When the Color Configuration dialog box appears, click on the first radio button (“They are a single color…”). 8. Click the color box (blue in the above graphic) to define the color of this element. 9. Click OK when you’re done and you’ll get a dialog box telling you what you just did — hit OK on this dialog to close it. 10. That’s it. You’ve successfully defined a group of single 16 elements for your display.